Hong Kong is a “special administrative region” of China, together with Macau. This tiny state boasts seven million people, so it’s not surprising it is known for its skyscrapers. Because of the dense population more than 90 % of people travel by public transport, more than in anywhere else in the world. The name Hong Kong apparently means “fragrant harbour”. Hong Kong was occupied by Britain in 1841, though it was temporarily invaded by Japan in the second World War. After that it was a part of United Kingdom until 1997. The cuisine of Hong Kong has been influenced by China (especially Canton), but also Japan, other Asian countries and Europe, due to its colonial past. Most meals feature rice or noodles. There is usually a dessert, one typical Hong Kong dessert being a pudding cake called Put chai ko. There are many other kinds of sweet pastries as well. Seafood, eggs, tofu, shiitake mushrooms and Chinese cabbage are popular ingredients, as are some more exotic ones like lotus seed, jujube and kai-lan. Street food stalls (hawkers) are not as common as they used to be, thanks to stricter health regulations. Many Hong Kong recipes I found used tea as a seasoning. Mix the ingredients from tempeh to sesame oil and 3 tbsp of the water and let marinate for a bit. Fry on a pan. Mix the rest of the water, corn starch, oyster sauce, soy sauce together and add to the tempeh. Heat up and let thicken. Steam the kale until tender and mix with the ginger juice, salt and sugar. 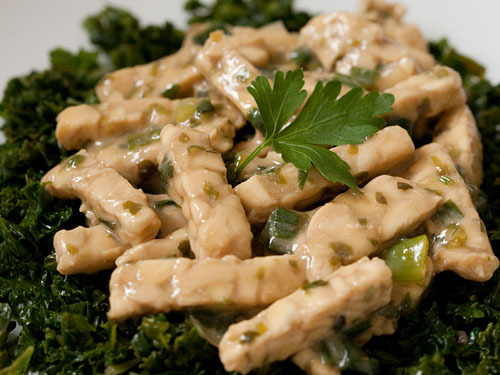 Serve the tempeh and the sauce on top of the kale. This entry was written on June 10th, 2011 by Maija Haavisto and filed under Asia, Protein main dishes.